Books that shape the world of ideas are essential to our understanding of society; that is why university presses are so important. Columbia University Press publishes books that effect real change but do not generate the level of revenue that commercial publishers require. Further, the majority of our books—which receive accolades from academic communities within and outside of Columbia University—are specialized and cost more to publish than their sales will support. Philanthropic funds, including gifts from individuals and foundations, are critically needed to subsidize our exceptional publications and extend our digital initiatives into the future. Columbia University Press is a premier scholarly publisher that advances Columbia University’s global mission through the publication, translation, and distribution of books in an array of disciplines and professional programs on subjects of worldwide significance. The Press’s publishing programs also reflect the importance of its location in New York City. Columbia University Press is the fourth-oldest and sixth-largest university press in the nation. We cordially invite you to join at the Investor ($5,000), Patron ($2,500) or Sponsor ($1,000) level. Your tax-deductible gift will enable Columbia University Press to publish original research and ideas by scholars and public intellectuals, including first-time authors. Columbia University Press receives ongoing support from a number of organizations and private donors. Our generous donors give life to pathbreaking, influential, and enduring scholarship. Pictured at the 2018 Columbia University Press Distinguished Book Award ceremony (from left to right): Jennifer Crewe, Associate Provost and Director Columbia University Press; Neil Krishan Aggarwal, Winner 2018 Columbia University Press Distinguished Book Award; Jane Gaines, Chair Faculty Publication Committee and Co-Chair Distinguished Book Award Jury; John Coatsworth, Provost, Columbia University. The annual award is given to the book that brings the highest distinction to Columbia University and Columbia University Press through an outstanding contribution to academic and public discourse. 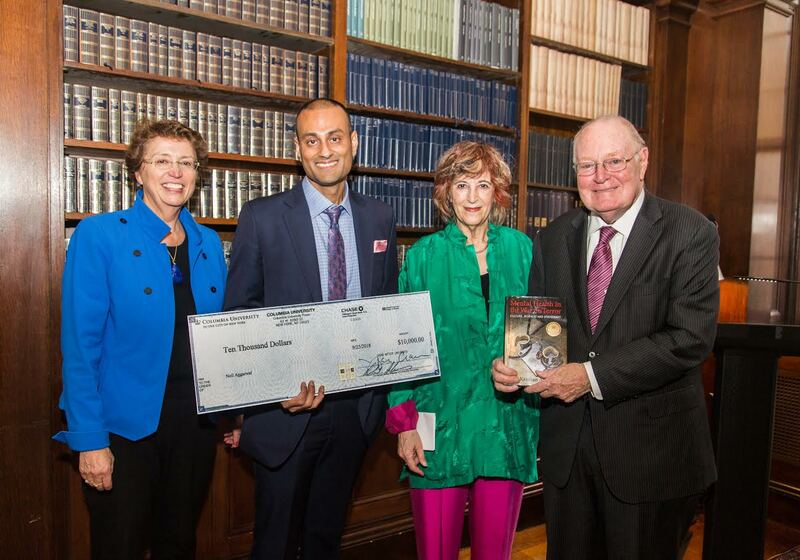 The fourth-annual Columbia University Press Distinguished Book Award was awarded to Neil Krishan Aggarwal for his book Mental Health in the War on Terror: Culture, Science, and Statecraft. Read an excerpt from the first chapter of Mental Health in the War on Terror: Culture, Science, and Statecraft.